Okay, yesterday was the day, the homemade pizza day. In all honesty, I was a bit nervous. While I very much enjoy cooking, I almost fear baking. I think my biggest problem is that I don't like to follow recipes (I guess it's my way of being rebellious! ), and most of the time that's just fine when it comes to cooking. However, you really have to follow a recipe when you bake (at least when you are like me and don't know what you are doing...). For the pizza crust, I followed (yes, followed!) 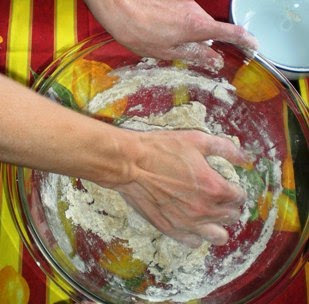 Alison's recipe for whole wheat pizza crust. 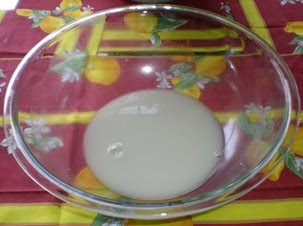 Next, I dissolved the yeast in some warm (but not hot!) water. See, I paid attention. :o) I let the yeast hang out for 5 minutes. 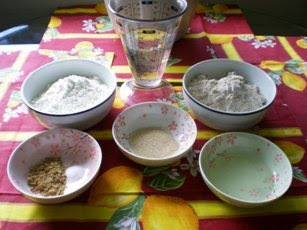 Then I added all the ingredients, except for 1/2 c of flour. 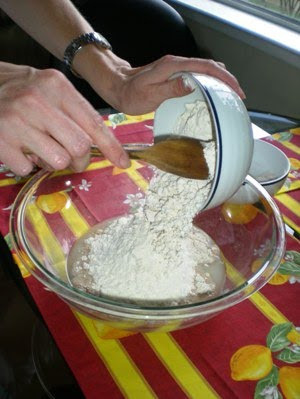 Then I kneaded the 1/2 c flour into the dough for 5 minutes. Boy, this is a great dish for a day when you need to get out some aggression... 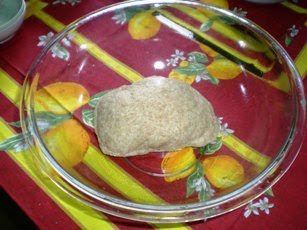 This is what the dough looked like after I kneaded it for 5 minutes. 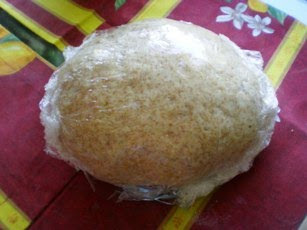 I coated the dough with a little oil and covered it with some plastic wrap. 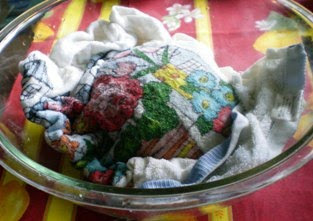 Then I covered it with a warm, wet kitchen towel and let it rest and rise for 15 minutes. I put a little oil on a pizza pan and coated the pan evenly. I put the dough onto the pizza pan. 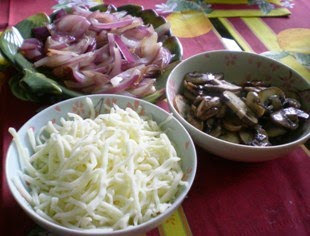 Here are the pizza toppings that I had prepared ahead of time (sauteed mushrooms, onions & shredded mozzarella cheese). I decided to keep things simple the first time around and use ingredients I had already, but I'll definitely experiment with all your suggestions from the other day soon! Here is the pizza, ready to go into the oven! Finally - the pizza is ready to take out of the oven! Everyone liked it! 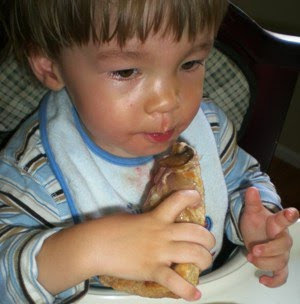 The toddler ate 3 slices! The teenager suggested to add a bit more cheese next time though. 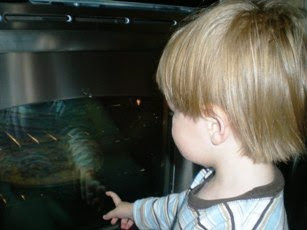 Questions: Do you follow directions when cooking or baking? Have you ever had any disastrous results because you didn't follow the directions? Awww YAY! I'm so glad it turned out! Pizzie looks totally awesome and I agree, pizza dough always seems so daunting to me and it's definitely not as hard as I thought. 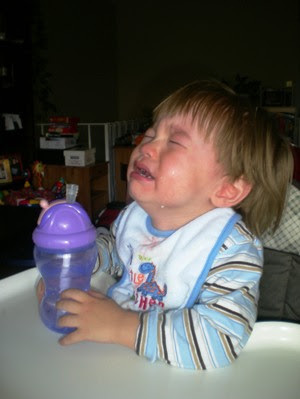 The toddlers face broke my heart! Isn't it funny how sad they look in pictures when they are crying, but when you are really there with them in the moment it's not quite as sad? Three pieces?! Wow!! He's got a good, healthy appetite :) Your teen's comment about the cheese sounds like my bf Nick, he always says "Gina, more cheese please!". I don't like putting a lot of cheese on my pizza, plus I like to add multiple types of cheese (like parmesan!! 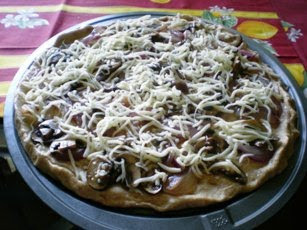 ), which he doesn't necessarily like :( Your pizza looks excellent, especially those delicious mushrooms! 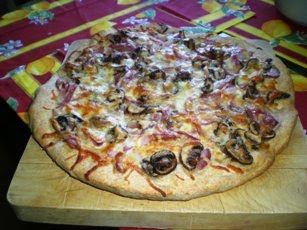 I love homemade pizza - yours looks great. 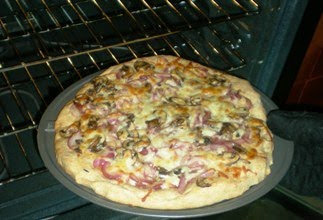 MMMMMMMMMMMMMMMMMMM ...yeah, we need a pizza night soon...I've been itchy to try a home made dough soon too. good for you!!!! glad the pizza put a smile on his lil face! I have a video of mine going BONKERS when I took some crust away...he was just a few months old and I didn't want him to choke...he was teething.... it's pretty funny! Nice. Homemade pizza is defnitely the best. 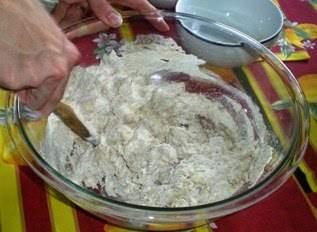 I always be a big batch of dough, so that I save divide them and save the other portions for another time. Yours came out lovely. I love to cook, but I'm intimidated by baking. My co-worker is taking a cake decorating class and she inspired me today to try baking more...this may be the second nudge that I need not fear baking! I am totally with you! Only I make 4 at a time because of the seven kids!!!! Yes, I use 10 - 11 cups of flour. Fortunately I have a really nice Bosch mixer that can handle it. We never buy pizza at a store anymore, because everyone complains they don't like it! Pizza making is so much fun! I dunno why we don't do it more often?! WOW! 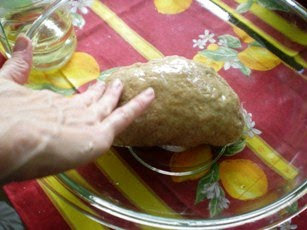 Score for making your own dough! Beats Papa Johns anytime! And me? haha, I NEVER follow recipes! I'll bet the house smelled amazing! The yeasty crust alone would make me cry having to wait for a piece. I measure with baking because it is like a science lab and all the proportions have to be right, but with everything else, I revert back to my farmhouse training and eyeball everything. btw...I love that retro looking table cover! That looks amazing and delicious! You've inspired me to give it a go. Pizza dough is always hit or miss for me depending on my patience level! I've never tried whole wheat dough, so this will be going on my to-do list. Thanks for the tips! Wow that looks so good. 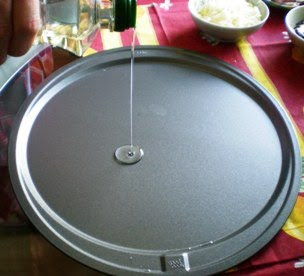 I've never tried to make a pizza from scratch but it really doesn't look that hard. Yours looks so delicious. 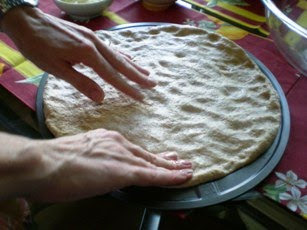 wow your dough looks so good :) I am always afraid to make my own. I love making homemade pizza! My only problem is that I get so impatient with waiting for the dough to rise because I am so excited about pizza. Ha. It's probably one of my favorite foods because you can really do whatever you want one with it. Yours look great! I'm glad you had better luck. If it can survive the toddler test, then it's got to be good...lol!